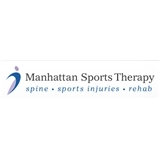 Manhattan Sports Therapy (New York) - Book Appointment Online! Dr Roland enabled me to run a marathon and resume training within one week of disk herniation. I avoided cortisone shots because of his expertise. After working with a couple of chiropractors, I can honestly say his treatments are superior to anything else I have ever experienced. Rachel is always great - very friendly and is always able to help fix my back. She is the best!